Iâ€™m a coffee freak. Not a coffee aficionado, mind you, knowing various blends and tastes and acidities. Just gimme caffeine, Iâ€™ll take it from there. So it was a great delight recently to find the Coffee Hound Coffee Bar up in Bar Harbor, a town I hadnâ€™t visited since the 1970s, much of which is new. Among the newest is the Coffee Hound, opened in early June by barista Chris Keegan. I grabbed a cup of Acadia Roast, expecting, well, coffee. But it was easily one of the best, smoothest blends ever, a whopping step up from the usual swill I make at home. I love those little pleasant travel surprises, and Keeganâ€™s shop fit the bill, a long, narrow space with the affable Keegan eager to discuss everything coffee with anyone interested in knowing. 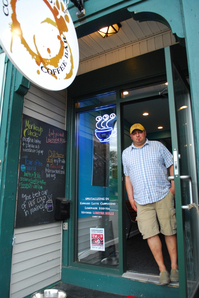 He gets his coffee from Carrabassett Coffee Company in Maine, going into details of various blends and what each has to offer. It apparently runs in the family: Daughter Cassidy was expected to work this summer at her dadâ€™s shop, herself a barista, her proud father says, not bad for a 15 year old. The coffeeâ€™s great here, as is the ownerâ€™s social conscience: He donates $1 for every bag sold to ReMAINE Healthy, a research collaborative with the goal of preventing kidney disease, where his girlfriend works. Keegan claims, as does anyone in town serving it, that he has the best lobster rolls, bar none in Bar Harbor. I didnâ€™t try it, but judging from looking around town, his was priced on the lower side, $13 for a roll with a quarter pound of lobster meat, $25 for a half pounder. He also serves hot dogs, including the Maine-centric red foot-long version, as well as Hebrew National brand and a quarter-pound all-beef version. Also here is a range of pastries, made by Epiâ€™s, a local restaurant, which also makes â€œtraveling blueberry piesâ€� solely for Coffee Hound, Keegan says. Whatever you get, a great place to enjoy is at Agamont Park across the street, a gorgeous hilly chunk of green space affording a terrific place to eat and look out over Frenchmanâ€™s Harbor. Coffee Hound is open through October, when much of the town shuts down and youâ€™ll have to find another place for your java. So if you go before, stock up, help a good cause and avoid drinking swill. I know I will, as long as my Acadia Roast bag lasts anyway.